New ECIL GET Recruitment 2018 notification details here. 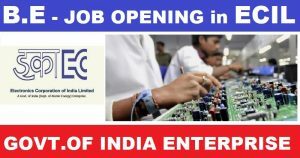 The ECIL jobs are Graduate Engineer Trainee posts of 84 vacancies. ECIL GET Recruitment through GATE-2018 score recruiting this 84 posts. Complete the submission of online registration form from 16 Jan 2018 from 2 PM to 15 Feb 2018 till 4 PM @ecil.co.in Graduates who are looking for technical jobs can apply. Check ECIL Graduate Engineer Trainee Recruitment 2018: Central government Technical job opportunity for the Graduate completed candidates is released. Cannot it is a good news for the candidates who are graduates but waiting for a central government job opportunity especially in their technical or core field. Yes it is definitely a sure one. So know about that latest central Technical employment recruitment notification. The title of that vacancy notification is ECIL GET Recruitment 2018 . It has been advertised about the 88 graduate engineer trainee vacancies through the Gate-2018 mainly in its Hyderabad branch. Present the appointed candidates will be appointed in the Hyderabad region only later depending on the ECIL requirements the place of job may chances to other ECIL branches. Get full clues of this ECIL recruitment of GET posts now. Latest Update (13th Jan 2018): ECIL again released the new notification for the 88 Graduate Engineer Trainee Posts on the basis of GATE-2018 Score. Check the full details here. ECIL GET jobs Online Application Form: ECIL full form is Electronics Corporation of India Limited. ECIL established recently having head quarters at Hyderabad to give best services in the filed of Electronics. It main services in the field of Nuclear energy, space and Defence. This is the brief profile of the ECIL. Let’s back to our main point in this post. ECIL for the Hyderabad region recruiting the 84 Graduate Engineer Trainees for some projects. To inform about it to all the public and tell them to submit the online format of application specifically by the appropriate candidates , a notification is released on the official web portal of ECIL. Minimum 65% marks attained graduates and gate 2018 qualified candidates only eligible for these 84 ECIL jobs. So people who have the pointed educational qualifications along with appropriate age limit have to fill the details in the application form before 15th Feb 2018. The complete qualifications for ECIL GET Recruitment 20118 notification as per the job wise. Graduation Completed candidates in the respective discipline with minimum 65% of marks are eligible for these vacancies. Gate-2018 Valid Score is compulsory to apply for these ECIL GET 2018 recruitment. Candidates, age must be as per the ECIL GET Recruitment 2018 that is maximum age is 25 years. Age Relaxation will be applicable for the reserved candidates. Candidates have to pay the non-refundable application fees. Selected candidates will get the pay scale as per the norms of the ECIL GET Recruitment 2018 is as follows. For 2nd year is Rs. 49,210/- per month , For 3rd year is Rs. 50,690/- per month . After contract period, the candidates will be appointed as Technical Officer with salary of Rs. 16,400-40,500/- per month. Take the printed copy of the submitted application form . At ecil.co.in ECIL Graduate Engineer Trainee Job Gate 2018 Notification is kept by the recruitment department of ECIL. So who need to know about these ECIL recruitment 2018 details must stay tuned to the ECIL main source portal. If you want to check it here in Recruitmentindia.in, then in less span of time full information can be given to you by us. The open link of the GET application form also shown at the bottom of this recruitment post. You can fill the details using that link in between the 16th Jan to 15th Feb 2018. After 15th Feb 2018, the deactivation of the ECIL application link will occur. Grab all the particulars of ECIL GET Recruitment at a single place. That single place is this post. One more fact we want to inform you here not only the recruitment details additionally you can also get the syllabus of this GET exam,Previous papers. Download that syllabus pdf, GET question papers which will help you to be in the CBT merit list of forwarded candidates to the interview round. Furthermore preparation study tips also given in our page for the comfort of the ECIL applicants.